Five years ago, on January 23 2009, a CIA drone flattened a house in Pakistan’s tribal regions. It was the third day of Barack Obama’s presidency, and this was the new commander-in-chief’s first covert drone strike. Initial reports said up to ten militants were killed, including foreign fighters and possibly a ‘high-value target’ – a successful first hit for the fledgling administration. But reports of civilian casualties began to emerge. As later reports revealed, the strike was far from a success. At least nine civilians died, most of them from one family. There was one survivor, 14-year-old Fahim Qureshi, but with horrific injuries including shrapnel wounds in his stomach, a fractured skull and a lost eye, he was as much a victim as his dead relatives. Later that day, the CIA attacked again – and leveled another house. It proved another mistake, this time one that killed between five and ten people, all civilians. The Pakistani government also knew civilians had been killed in the strikes. A record of the strikes made by the local political administration and published by the Bureau last year listed nine civilians among the dead. But the government said nothing about this loss of life. Yet despite this disastrous start the Obama administration markedly stepped up the use of drones. Since Obama’s inauguration in 2009, the CIA has launched 330 strikes on Pakistan – his predecessor, President George Bush, conducted 51 strikes in four years. And in Yemen, Obama has opened a new front in the secret drone war. Across Pakistan, Yemen and Somalia, the Obama administration has launched more than 390 drone strikes in the five years since the first attack that injured Qureshi – eight times as many as were launched in the entire Bush presidency. These strikes have killed more than 2,400 people, at least 273 of them reportedly civilians. Although drone strikes under Obama’s presidency have killed nearly six times as many people as were killed under Bush, the casualty rate – the number of people killed on average in each strike – has dropped from eight to six under Obama. The civilian casualty rate has fallen too. Strikes during the Bush years killed nearly more than three civilians in each strike on average. This has halved under Obama (1.43 civilians per strike on average). In fact reported civilian casualties in Pakistan have fallen sharply since 2010, with no confirmed reports of civilian casualties in 2013. The decline in civilian casualties could be because of reported improvements in drone and missile technology, rising tensions between Pakistan and the US over the drone campaign, and greater scrutiny of the covert drone campaign both at home and abroad. 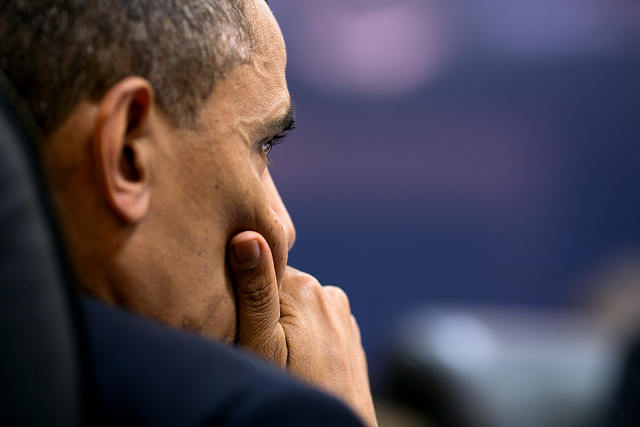 Obama has sharply escalated the drone campaign in Pakistan. The apparent change in targeting is well demonstrated by comparing a strike carried out by the Bush administration in 2006 and one seven years later under Obama. On October 30 2006 at least 68 children were killed when CIA drones destroyed a madrassa – a religious school – in the Bajaur area of Pakistan’s tribal belt. The attack was reportedly targeting then-al Qaeda second-in-command Ayman al Zawahiri. He escaped. On November 21 last year, drones again targeted a madrassa, this time in Hangu, outside the tribal regions. As many as 80 students were sleeping in the building. But the strike destroyed a specific portion of the building – just one or two rooms – and killed between six and nine people. In Yemen, however, civilians continue to die in US drone strikes. Last year saw the highest civilian casualty rate since Obama first hit the country in 2009. Drones were not the first weapon the administration turned to when it started to attack the country. On December 17 2009 a US Navy submarine launched a cluster bomb-laden cruise missile at a suspected militant camp in al Majala, southern Yemen. The missile slammed into a hamlet hitting one of the poorest tribes in Yemen. Shrapnel and fire left at least 41 civilians dead, including at least 21 children and 12 women – five of them were pregnant. A week earlier President Obama had been awarded the Nobel Peace Prize. He used his acceptance speech to defend the use of force at times as ‘not only necessary but morally justified’. He warned that ‘negotiations cannot convince al Qaeda’s leaders to lay down their arms’. Strikes in Pakistan are carried out by the CIA. But in Yemen the CIA and the US military’s special forces unit, Joint Special Operations Command, have used various weapons including drones and conventional jets as well as cruise missiles to target al Qaeda militants. However in recent years drones have come to dominate Obama’s war in Yemen as much as in Pakistan. President Bush ordered a single drone strike in Yemen, killing six people in 2002. 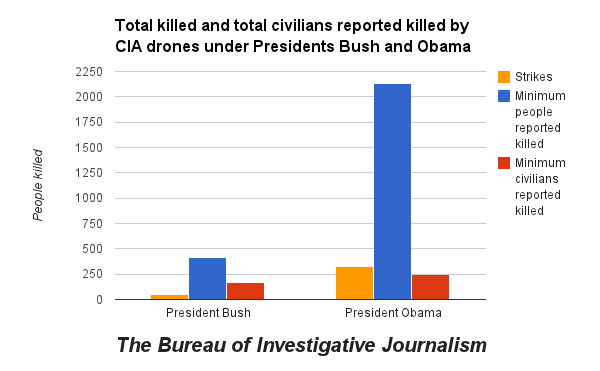 Under Obama, the CIA and the Pentagon have launched at least 58 drone strikes on the country killing more than 281 people, including at least 24 reported civilians. In this period Bureau records show drones reportedly killed at least 236 civilians – including 61 children. And according to a leaked CIA record of drone strikes, seen by the McClatchy news agency, the US often did not know who it was killing. In the year after September 2010 at least 265 of up to 482 people were recorded as the documents as killed by drones ‘were “assessed” as Afghan, Pakistani and unknown extremists’. A letter written by Attorney General Eric Holder and leaked to NBC confirmed drones had killed four US citizens living abroad. US citizen Anwar al Awlaki died in a missile strike in Yemen on September 30 2011. His 16-year-old son Abdulrahman, who was born in Detroit, was killed in a separate strike two weeks later. In April 2013 a leaked Department of Justice memo outlined the administration’s legal justification for such killings: the US has the right to kill US citizens if they pose an imminent threat, it said. It added that determining a citizen poses an imminent threat ‘does not require the United States to have clear evidence that a specific attack on US persons and interests will take place in the immediate future’. Jameel Jaffer of the American Civil Liberties Union described the memo as a ‘chilling document’. The following month President Obama made a major policy speech in which he codified the rules his administration must follow as it selects targets for drone strikes and special forces teams. The rules are meant to constrain the use of drones. Obama said the US only carries out such attacks against individuals who pose ‘a continuing and imminent threat’ to US citizens, not ‘to punish individuals’. Obama acknowledged drone strikes had killed civilians, saying: ‘For me, and those in my chain of command, those deaths will haunt us as long as we live.’ And he added: ‘Before any strike is taken, there must be near-certainty that no civilians will be killed or injured – the highest standard we can set’. However Bureau analysis shows more people were killed in Pakistan and Yemen in the six months after the speech than the six months before. And the casualty rate also rose over the same period. In 2013, there were no confirmed civilian casualties in Pakistan – the first year of the drone campaign that this was the case. But in Yemen, the year ended with mass civilian casualties. On December 12, JSOC drones attacked a convoy taking a bride to her wedding. The attack destroyed several vehicles and flying shrapnel killed up to 15 civilians. It was the biggest single loss of civilian life from a US strike for more than a year. The Yemeni government initially claimed al Qaeda militants were killed. But the Yemeni government quickly negotiated reparations with the families of the victims, sending them $140,000 and 100 rifles. The US has not commented on the strike, but in an unprecedented move Washington is carrying out an investigation.